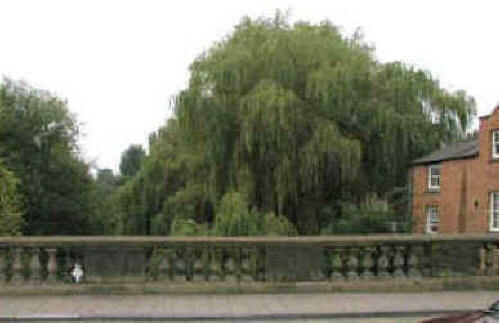 THE "curtain" that is a willow tree near to the Welsh Row sandstone road bridge is much neater and less of an obstruction nowadays which makes this Letter from Nantwich a little less urgent. But I have left it in place as a moment in the town's history and because it was the first letter I wrote on this website. Plus the fact that the information contained in it is historic and so still relevant. IT is said that living in an area full of trees is very healthy as the groups and rows of trees take in carbon dioxide and give out oxygen. In that case, Nantwich must be extremely healthy. We seem to have a great many trees, although I am not claiming to have carried out a survey. No, it is just that areas which offered an open vista when I was a boy are now a woodland view. Perhaps the most noticeable for me is the bridge over the River Weaver (right) between High Street and Welsh Row. At one time you could stand on the bridge and look upstream to a multi-storey brick building, Nantwich Corn Mill - as seen in George Thompson's painting for Clewlow's the butchers (below*). At least you could until it burned down one evening in 1970. I remember that I was going past in a hurry to get somewhere on time. not having my camera with me to record this moment in history, but there wasn't time to go back home for it and still be on time for where I was going. trees as I crossed the bridge, but it was only when I wanted to take a photograph of the bridge from the Waterlode for this website that I realised that I couldn't see the bridge for the trees. The river was, and must be still, very shallow at this point, and I have childhood memories of a sandbank in the middle of the watercourse in the summer with children and adults making the most of the "beach" revealed as the water level dropped. (See the painting left). I well remember hearing of a young constable who was new to the town standing on the bridge preparing to jump into the river to save a child who had got out of his depth in the deeper water under the bridge. Luckily, a passer-by stopped him or he would have broken his neck in his heroic rescue bid. That's one thing about trees - they grow and change the view. When some trees have to be felled because they have become diseased, saplings are immediately planted and these, too, flourish - even though some unfeeling people seem to have a desire to snap them off soon after planting. Waterlode just visible on the left - in early March 2007 - when the willow trees were less intrusive. 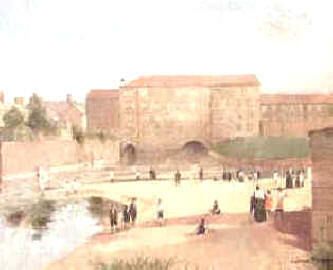 lThe picture of Nantwich Mill (left) is used with the kind permission of H.Clewlow, the Pepper Street butchers, who commissioned the work for their 2003 calendar. Click here to visit the Clewlow's website.